I touched upon Running Man in Stone Cities Variety Year in Review post but, despite my better nature, I did not go all Running Man crazy. Largely because I had ulterior motives- also known as this post. Muhahahahahahahahaha. Henceforth are Stone Cities top ten Running Man episodes of 2013 in the order of air date. Feel free to add yours in the comments. Cheers! The first episode of 2013 was memorable for a few reasons. The Monday couple kicked off the New Year with a wave, and the Busan Flower Boys made an epic appearance. Gary and these four were immensely entertaining, so much so that almost a year later I am still rewatching this episode for some laughs. Anytime the cast of Running Man goes a traveling is usually entertaining, but this episode in particular had me in stitches. Kwang Soo solidified his role as Asia’s Prince and the challenges were larger (or should I say higher) than the average episode. Seriously, this is one freaking hilarious episode. Running Man took on the drama That Winter the Wind Blows with a lot of body gags and Kwang Soo as a girl. Ji Hyo even helped him fix his hair and makeup. There is a variety god! Or maybe intentional?! After all this episode brings together the betraying trio- Ji Suk Jin, Lee Kwang Soo, and Haha – and pits them against the rest of the Running Man cast plus guests. Oddly enough, the cast is largely incompetent at this challenge, letting this trio of scoundrels get far further in the games than I would have ever imagined. Maybe it is that surprise that makes this episode that much more entertaining. 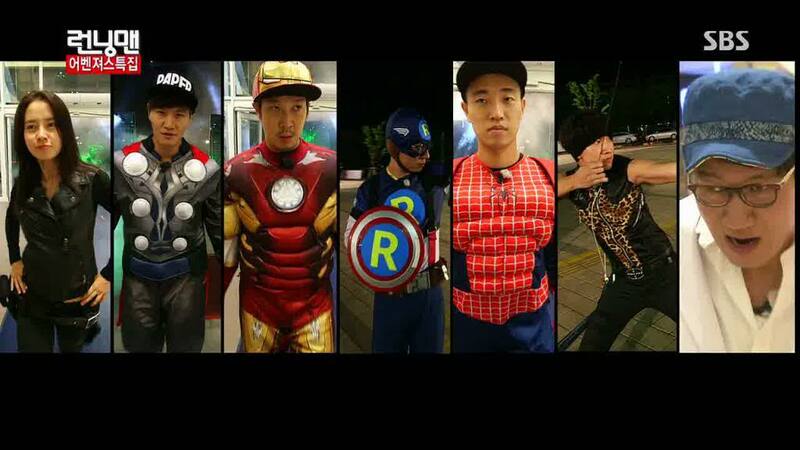 There was so much of what makes Running Man awesome in this episode. While the guests were eye candy (kind of literally) the cast was epic. 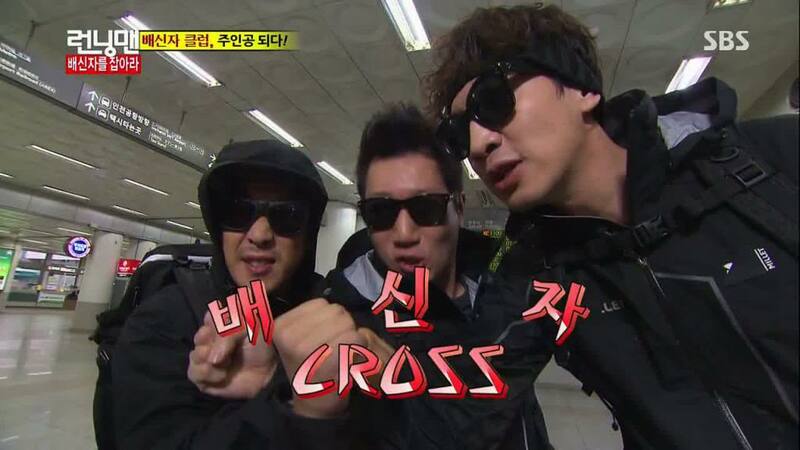 Kwang Soo and Kim Jong Kook went from throwing each other around to holding hands, all in the span of an episode. Hugs, hugs, hugs? Okay, maybe I hope for too much. Yes, the cast had superpowers (they portrayed the Avengers after all), but the guests and the sheer odds of winning seemed impossible. Which made this episode that much more fun (though I have read pretty of opinions that say otherwise, this one won me over). We were treated to a teaser at the end that promised another Avengers episode sometime in the future. I am waiting…..
Patrice Evra was amazingly entertaining in this episode. Park Ji Sung is still one of my favorite Running Man guests, my admiration of him bolstered with this episode. Plus, Sulli said a swear word. Sorry, I had to. Seriously, that is the reason I loved this episode. The cast were each matched up with two members of an idol group- complete with a dance number in the start of the episode. KJK and Sistar- I…I….just can’t. The kiss. The kiss. I am still going on about it almost 3 months later. Oh, and G-Dragon was covered in mud. I am 100% in love with this episode. “Dad, this is the hyung that always bullies me!” I will leave it at that. Thanks for this great list!!! I just watched Win Princess Ji Hyo’s Heart and it was hilarious! Can’t wait to watch all of your other picks! Happy you have found the list useful 🙂 Win Princess Ji Hyo’s Heart is one freaking funny episode! I agree with everything on this list! Except perhaps the Avengers episode but that was probably too high expectations on my part. But YES. Episode 127! That is probably one of my most favourite episodes of the entire series! Gary and the four boys had amazing chemistry, and it was such a fun episode overall. I’d also add in the top 10 the Marry The Fool episode. Anytime Noh Sa Yeon is on it will almost always be golden. Also, that was Monday Couple’s first almost kiss! And the entire quiz sequence made me laugh till I cried. Marry the Fool was an awesome episode! I love Noh Sa Yeon’s appearances because everyone fights to not be on her team (and she is all like “I am a Queen!”). Haha! The Avengers episode was something that could have been more, I agree, but I still really liked it based on the fact the odds were so stacked against the cast it felt hilariously sadistic on the part of the PDs. Oh, and Ji Suk Jin as the hulk…daebak. I also enjoyed ep 130 – Reincarnation (because it was a Best RM member episode, and the story line is pretty cool, very unexpected (I enjoyed the MC moments in this ep too). Another one from recent months which I like to is ep 151, because I loved the final game – very exciting and very intense, and you can actually see how anxious Haha was looking at the TV screens. On-the-edge-of-the-seat-throughout-the-game episode. I love your picks on every posts! Because I was just a bit late to becoming a Running Man fans and there were already hundreds of episodes, so I just see your posts and follow it to decide which episode should I watch and I’m not disappointed. Your choices are really daebak~!